We’ve seen many stories, films, and television specials about Bobby Fischer, who has a reputation for being the greatest Chess player to ever walk the Earth. It’s also well documented on how Fischer fell into madness and became a recluse from his paranoia until his death in 2008. Fischer was for sure a strange and chaotic man, but he was also a genius and fairly charismatic when he wanted to be. Needless to say, Bobby Fischer’s life is as interesting as it is sad and is worth telling, which is why so many people have told it over the years. 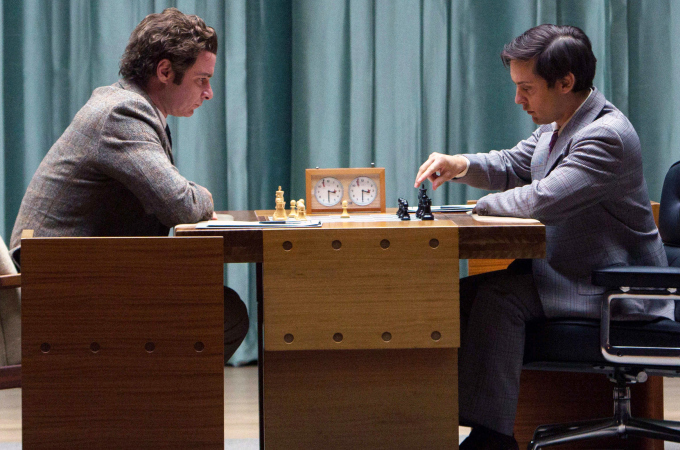 But with director Edward Zwick’s (‘Glory‘, ‘Legends of the Fall‘, ‘Blood Diamond‘, ‘The Last Samurai‘) excellent ability to tell a story and Steven Knight’s (‘Locke‘, ‘Eastern Promises‘) fantastic, yet brutal script, we finally get to the bottom of Bobby Fischer’s descent into madness as he’s challenging the Russians to a game of chess for the world championship in ‘Pawn Sacrifice‘. 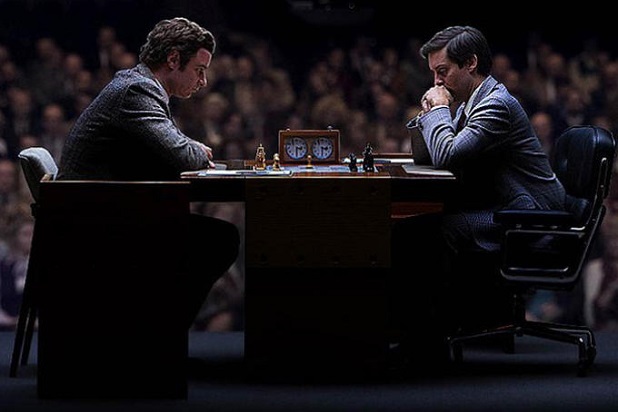 This is somewhat of a biographical film, and although it does show a young Bobby Fischer for a short amount of time on screen, the film’s main focus is over the span of a couple of years where we start to see Bobby (Tobey Maguire) show signs of his mental illness and challenge Boris Spassky (Liev Schreiber) to the world championship of Chess. At first, we see Bobby as a very charming young man who loves to talk to the press when he wants to, exuding an almost Muhammed Ali vibe about talking about his talent and opponents. On the other hand, he can be as vicious and cruel to anyone around him if he doesn’t get his way, which at times is very unreasonable. This is where Tobey Maguire shines. I’ve always enjoyed watching Maguire on screen and he’s come a long way since his days as Spider-Man. Maguire lets it all hang out here as he struggles with his illness and rocky life in the limelight, which at the time, he was one of the most famous people in the world. Not only that, but he was the poster boy for the United States of America, beating the Russians during the end of the Cold War. After quitting and losing to the Russians and claiming they cheated, Fischer chose to retire from chess, however a lawyer/manager/”friend” in Paul Marshall (Michael Stuhlberg) talked Fischer into beating the Russians in a series of games for the World Championship on a lengthy list of demands. To accompany Fischer on his journey to maintain his sanity was long time friend and “only person to have beaten him at chess” was William Lombardy (Peter Sarsgaard), a priest who enjoys drinking and smoking, and of course playing chess. The banter with these guys is quite fun, but at times very sincere as they want the best for their friend Bobby, but as we learned, the greatest chess player of all time would do what he wanted, when he wanted, and became paranoid that the government, Russians, and Jews were out to get him, even though he was Jewish himself. I did like that Zwick gave us some little hints that probably some of the greatest minds in chess all had some sort of insanity in showing that Boris Spassky showed signs to of paranoia, and that it wasn’t just Fischer. 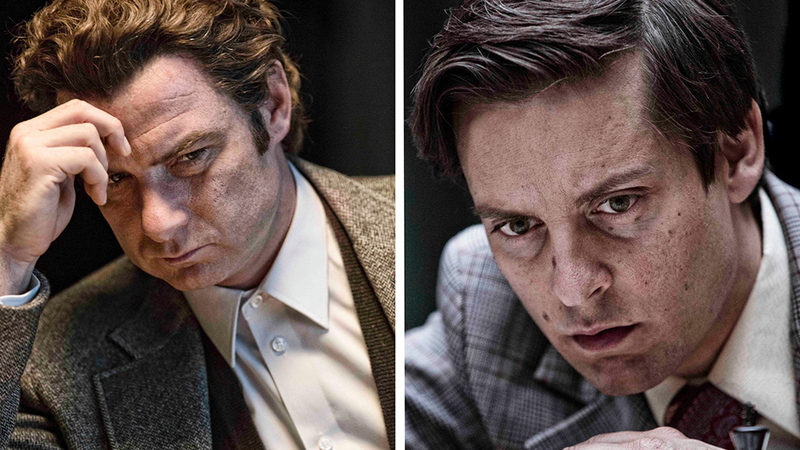 With an excellent screenplay and a fantastic performance by Tobey Maguire, which might give him some attention come award season, ‘Pawn Sacrifice‘ is definitely worth your time. This entry was posted on Wednesday, September 16th, 2015 at 10:07 am	and is filed under Film, News. You can follow any responses to this entry through the RSS 2.0 feed. You can skip to the end and leave a response. Pinging is currently not allowed. You insensitive prick! Do you have any idea how much that stings?